Once a month or so, my mother sends me a box from home filled with food. 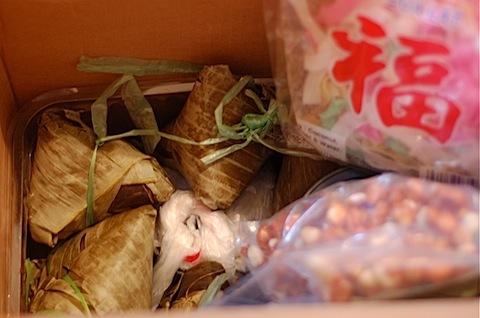 The last one, timed perfectly for lunar new year, included a batch of rice cakes. Before I even saw them, though, I knew there was treasure buried somewhere deep beneath her homemade peanut brittle, gingery mustard pickles from the last greens in her garden and bags of candied coconut used as packing material. The distinctive green-tea aroma of banana leaves had emerged as soon as the packing tape was cut. Throughout the tropical sun belt, banana leaves appear as easy, inexpensive, natural, sanitary—and most importantly—delicious packaging. 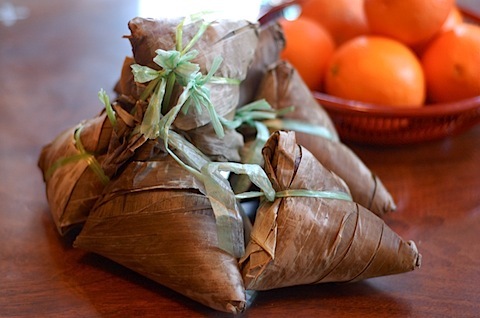 From Mexican tamales to Indian wedding feasts, Malaysian lunches to Vietnamese fast food, the leaves provide pliable wrapping, compostable tableware and a lovely flavoring for steamed or simmered specialties. Throughout Southeast Asia, you’ll see banana-wrapped foods for sale as street food. Food sealed within their layers and then cooked slowly will keep for days without being refrigerated. Traditional foods for the lunar new year period are often cooked in banana leaves, especially for serving during the first three days when families are supposed to be enjoying each other’s company rather than cooking. For my mom and all my generous, food-loving aunts, banana leaves are perfect for the three-day priority mail period between the Midwest and California. Virtually all Asian and Latino markets with a freezer section will stock banana leaves that have been folded and frozen into large squares. Though more delicate than fresh leaves, they’re easy and convenient to use. If you’re lucky enough to have a pesticide-free tree somewhere in your neighborhood, you might offer a trade in sweet or savory treats for an armful of fresh leaves. Berkeley Bowl often stocks fresh leaves, and there are also numerous mail-order sources for fresh leaves, such as Florida-based Greenearth. Cook long-grain rice, substituting 1/4 to 1/2 cup of the water or stock with coconut milk. Add a few slices of ginger, a cinnamon stick and a pinch of turmeric. After the rice is cooked, stir gently and then prepare small packets of the rice. Steam for 20 minutes and then serve with curries or grilled fish. Rick Bayless offers a recipe for banana-leaf wrapped Red Chile Pork Tamales at his Frontera website. We’re lucky enough to live in an area where tamale dough is available pre-made in Latino markets. Leftover or take-out chicken mole is a most excellent substitute for slow-cooking your own filling. For variety, sprinkle green olives, bell peppers or corn kernels over the filling before enclosing and cooking. Small packets are a fun alternative at summer grill parties, while a hot oven is a perfectly decent rainy-weather option for a dramatic yet simple dinner-party dish. Rub sea bass or salmon with a generous amount of prepared Thai red curry paste thinned with a small amount of oil. I prefer using a whole fish and filling its cavity with scallions and lime wedges, but you can easily use steaks or fillets. Wrap a whole fish completely in three layers of banana leaves, alternating the grain of the banana leaf to crisscross from layer to layer for added stability. Individual portions can be wrapped in one large rectangle on a bed of scallions and lime slices. Tie tightly with wet string and then grill over medium high coals or roast at 400 degrees, allowing 10 minutes base time plus 10 minutes for every inch thickness of the banana leaf packets. Thinly slice full-flavored mushrooms and toss them with diced tomatoes (drain well if using canned), chopped scallions, grated ginger, cilantro, salt and black pepper. Wrap in individual packets and bake or grill until completely charred on the outside. Serve as a side dish with steamed rice and grilled chicken or pork. Cover about 2 cups of sticky rice with 3 inches of water and let soak for at least 4 hours, preferably overnight. Drain well. In a small bowl, mix together 1 cup each of grated coconut and chopped, roasted peanuts. Stir in a few spoonfuls of brown sugar to taste (omit if using pre-sweetened coconut) and then a healthy sprinkling of salt. At the center of a large square of banana leaf, mound 1/4 cup of sticky rice, layer 1/4 cup of the filling, then finish with 1/4 cup more of sticky rice. Fold the leaf in thirds like a letter, then fold in the two side-flaps to overlap at the center; tie securely with string. Steam for one hour, then let cool completely before serving as mid-morning or afternoon snacks with strong tea. If you’re used to Saran wrap or foil, there’s a bit of an adjustment to using natural material that’s irregularly shaped and varied in texture from package to package, leaf to leaf. But banana leaves are immensely fun to work with, and their flavor is far, far superior to plastic or metal. Like crepes, practice with one or two or three first to get into the groove. Each thin package of banana leaves doesn’t look like much, but there’s a lot folded up in there. The leaves are inexpensive enough that you can get an extra one for back-up if it’s your first time working with them. A couple of hours in the fridge or a few minutes submerged in very hot water will thaw out frozen leaves. I usually place the leaves in my empty sink, and then pour boiling water over them to clean and soften them. I keep them in the hot water until just before I need them, wiping a few at a time with a cloth to absorb excess moisture. Always wipe in the direction of the grain to prevent splitting the leaves. Soak some toothpicks or kitchen string at the same time. I prefer string for larger parcels of food, since the toothpicks can cause more damage then their convenience is worth. If you forget to soak the string or toothpicks, expect to see them char completely if grilled or roasted. If you’re making very small packets, you can use thin strips of the banana leaf itself as ties. With a pair of scissors, trim away the hard, center vein of the leaf. Sometimes, I use the hard edges as extra support for larger packages, such as whole fish, but it can cause the leaf to split, so it’s best to remove them until you’re comfortable working with larger leaves. For appearance sake, you might also want to trim away any yellow streaks. 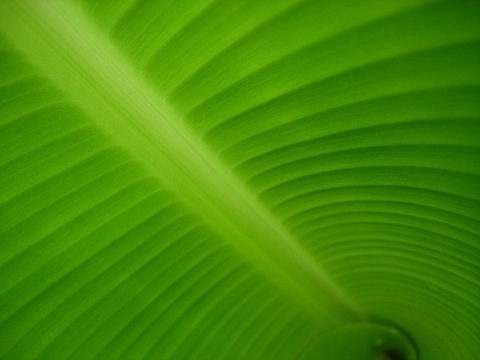 To repair and reinforce a split leaf, just place it on top of another leaf with its grain running perpendicular. When grilling large items, such as a whole fish, use a cookie sheet and two wide spatulas to transfer the package to the rack, to turn it halfway through the cooking period and to remove it when done cooking. For easier and more attractive serving, especially on a buffet table, use shears to snip open the packets. 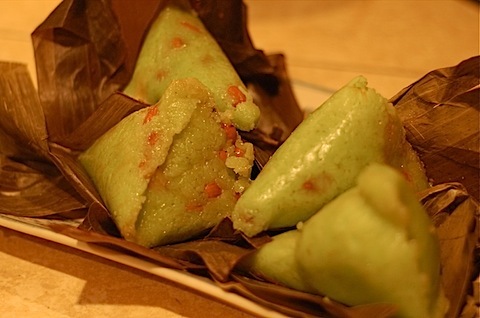 Banana leaf packets are perfect for preparing ahead of time and cooking later. They hold up to moist fillings and they’re easy to carry to potlucks and parties. Cover with a damp cloth to keep them moist in the fridge. Don’t wait more than three days to cook them, though. They’re organic material, after all, and will start fermenting if left raw too long. Once cooked, though, they and the food they hold last a surprisingly long time even at room temperature. While we have become spoiled by the apparent safety of refrigerators, much of the world still enjoys prepared snacks wrapped securely and deliciously in banana leaves.